Molded Products Can Rubber Feet Extend the Life of Your Product? Certain things seem like they were built to be accidentally dropped and abused. Take your poor cell phone for example. You love the thing, of course, but how many times have you dropped it? The massive plague of cracked cell phone screens is answer enough. The truth is, we humans are not always gentle with our possessions, even sensitive electronic equipment. Kids throw their toys around. Adults drop their tablets onto tables and counters. As a product manufacturer, you need to take into consideration that the product you have so painstakingly developed will likely be tossed around like a ragdoll by your customers. As part of the design, make sure you add features to protect your product, like a hard casing or rubber bumper feet that can absorb some of the shock if the product is slammed or dropped onto surfaces. Adding these features can extend the life of your product and keep your customers happy. 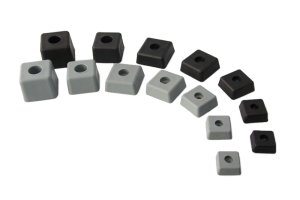 To order customized rubber feet for your product, contact us today.